Shortly after I started out as a professional baseball player, I got one of the biggest shocks of my life. That was back in 1007. I was playing for Johnstown, Pennsylvania, in the Tri-State League. I was young and ambitious -- wanted to get to the top -- and what happened? I was fired! My whole life might have been different if I hadn't gone to the manager and asked him why he fired me. In fact, I wouldn't have the rare privilege of writing this book if I hadn't asked him that question. The manager said he fired me because I was lazy! Well, that was the last thing I expected him to say. "You drag yourself around the field like a veteran who has been playing ball for twenty years," he told me. "Why do you act that way if you're not lazy?" "Well, Bert," I said, "I'm so nervous, so scared, that I want to hide my fear from the crowd, and especially from the other players on the team. Besides, I hope that by taking it easy, I'll get rid of my nervousness." "Frank," he said, "it will never work. That's the thing that is holding you down. Whatever you do after you leave here, for heaven's sake, wake yourself up, and put some life and enthusiasm into your work!" I had been making $175 a month at Johnstown. After being fired there, I went down to Chester, Pennsylvania, in the Atlantic League, where they paid me only $25 a month. Well, I couldn't feel very enthusiastic on that kind of money, but I began to act enthusiastic. After I was there three days, an old ball player, Danny Meehan, came to me and said: "Frank, what in the world are you doing down here in a rank bush-league like this?" "Well, Danny," I replied, "if I knew how to get a better job, I'd go anywhere." A week later, Danny induced New Haven, Connecticut, to give me a trial. My first day in New Haven will always stand out in my memory as a great event in my life. No one knew me in that league, so I made a resolution that nobody would ever accuse me of being lazy. I made up my mind to establish the reputation of being the most enthusiastic ball player they'd ever seen in the New England League. I thought if I could establish such a reputation, then I'd have to live up to it. From the minute I appeared on the field, I acted like a man electrified. I acted as though I were alive with a million batteries. I threw the ball around the diamond so fast and so hard that it almost knocked our infielders' hands apart. Once, apparently trapped, I slid into third base with so much energy and force that the third baseman fumbled the ball and I was able to score an important run. Yes, it was all a show, an act I was putting on. The thermometer that day was nearly 100$#176;. I wouldn't have been surprised if I had dropped over with a sunstroke the way I ran around the field. 2. My enthusiasm affected the other players on the team, and they too became enthusiastic. 3. Instead of dropping with the heat, I felt better during the game and after it was over than I had ever felt before. My biggest thrill came the following morning when I read in the New Haven newspaper: "This new player, Bettger, has a barrel of enthusiasm. He inspired our boys. They not only won the game, but looked better than at any time this season." The newspapers began calling me "Pep" Bettger -- the life of the team. I mailed the newspaper clippings to Bert Conn, manager of Johnstown. Can you imagine the expression on his face as he read about "Pep" Bettger, the dub he'd tied a can to three weeks before -- for being lazy? Within ten days, enthusiasm took me from $25 a month to $185 a month -- it increased my income by 700 per cent. Let me ?? ?epeat -- nothing but the determination to net enthusiastic increased my income 700 per cent in ten days! I got this stupendous increase in salary not because I could throw a ball better -- or catch or hit better, not because I had any more ability as a ball player. I didn't know any more about baseball than I did before. Two years later -- two years from the time I had been hoping to get $25 a month in that little Chester outfit, I was playing third base for the St. Louis Cardinals and had multiplied my income by thirty times. What did it? Enthusiasm alone did it; nothing but enthusiasm. Two years after that, while playing a game in Chicago against the Chicago Cubs, I had a bad accident. Picking up a swinging bunt while on a full run, I attempted to throw in the opposite direction. Something snapped in my arm. That accident forced me to give up baseball. This seemed like a great tragedy to me at the time, but I now look back on it as one of the most fortunate events of my life. I returned home, and for the next two years made my living riding around the streets of Philadelphia on a bicycle. I was a collector for an installmeat furniture concern; one dollar down and the balance in "uneasy" weekly payments, After two dismal years of collecting installments, I decided to try selling insurance with the Fidelity Mutual Life Insurance Company. The next ten months were the longest and most disheartening months of my life. A dismal failure at selling life insurance, I finally concluded that I was never cut out to be a salesman, and began answering want ads for a job as a shipping clerk. I realized, however, that no matter what work I tried to do, I had to overcome a strange fear-complex that possessed me, so I joined one of Dale Carnegie's courses in public speaking. One night, Mr. Carnegie stopped me in the middle of a talk. "Mr. Bettger," he said. "Just a moment...just a moment. Are you interested in what you are saying?" "Yes...of course I am," I replied. "Well, then," said Mr. Carnegie, "why don't you talk with a little enthusiasm? How do you expect your audience to be interested if you don't put some life and animation into what you say?" Dale Carnegie then gave our class a stirring talk on the power of enthusiasm. He got so excited during his Talk, he threw a chair up against the wall and broke off one of its legs. Before I went to bed that night, I sat for an hour thinking. My thoughts went back to my baseball days at Johnstown and New Haven. For the first time, I realized that the very fault which had threatened to wreck my career in baseball was now threatening to wreck my career as a salesman. The decision I made that night was the turning point of my life. That decision was to stay in the insurance business and put the same enthusiasm into selling that I had put into playing baseball when I joined the New Haven team. I shall never forget the first call I made the next day. It was my first "crashing through" session. I made up my mind that I was going to show my prospect the most enthusiastic salesman he'd ever seen in his life. As I pounded my fist with excitement, I expected every minute to have the man stop me and ask if there was anything wrong with me, but he didn't. At one stage of the interview, I noticed he raised himself to a more erect position and opened his eyes wider, but he never stopped me, except to ask questions. Did he throw me out? No, he bought! This man, Al Emmons, a grain merchant in the Bourse Building, Philadelphia, soon became one of my good friends and best boosters. From that day on, I began to sell. The Magic of Enthusiasm began to work for me in business, just as it had in baseball. I would not want to give anybody the impression that I think enthusiasm consists of fist-pounding...but if fist-pounding is what you need to arouse yourself inside, then I am overwhelmingly for it. I know this: When I force myself to act enthusiastic, I soon feel enthusiastic. During my thirty-two years of selling, I have seen enthusiasm double and treble the income of dozens of salesmen, and I have seen the lack of it cause hundreds of salesmen to fail. I firmly believe enthusiasm is by far the biggest single factor in successful selling. For example, I know a man who is an authority on insurance -- he could even write a book on the subject -- and yet he can't make a decent living selling it. Why? Largely because of his lack of enthusiasm. I know another salesman who didn't know one-tenth as much about insurance, yet he made a fortune selling it, and retired in twenty years. His name is Stanley Gettis. He now lives in Miami Beach, Florida. The reason for his outstanding success was not knowledge -- it was enthusiasm. As usual -- you failed to act! Why don't you memorize this poem, and repeat it daily. It may do for you what it did for Stanley Gettis. Once I read a statement made by Walter P. Chrysler. I was so impressed by it, I carried it in my pocket for a week. I'll bet I read it over forty times, until I knew it by heart, I wish every salesman would memorize it. Walter Chrysler, when asked to give the secret of success, listed the various qualities, such as ability, capacity, energy, but added that the real secret was enthusiasm. "Yes, more than enthusiasm," said Chrysler, "I would say excitement. I like to see men get excited. When they get excited, they get customers excited, and we get business." Enthusiasm is by far the highest paid quality on earth, probably because it is one of the rarest; yet it is one of the most contagious. H you are enthusiastic, your listener is very likely to become enthusiastic, even though you may present your ideas poorly. Without enthusiasm, your sales talk is about as dead as last year's turkey. Enthusiasm isn't merely an outward expression. Once you begin to acquire it, enthusiasm works constantly within you. You may be sitting quietly in your home..an idea occurs to you...that idea begins to develop...finally, you become consumed with enthusiasm...nothing can stop you. It will help you overcome fear, become more successful in business, make more money, enjoy a healthier, richer and happier life. When can you begin? Right now. Just say to yourself, "This is one thing I can do." To become enthusiastic -- act enthusiastic. Put this rule into action for thirty days and be prepared to see astonishing results. It may easily revolutionize your entire life. Force yourself to act enthusiastic, and you'll become enthusiastic! I urge you to reread many times this chapter by Frank Bettger, and to make a high and holy resolve than you will double the amount of enthusiasm that you have been putting into your work and into your life. If you carry out that resolve, you will probably double your income and double your happiness. 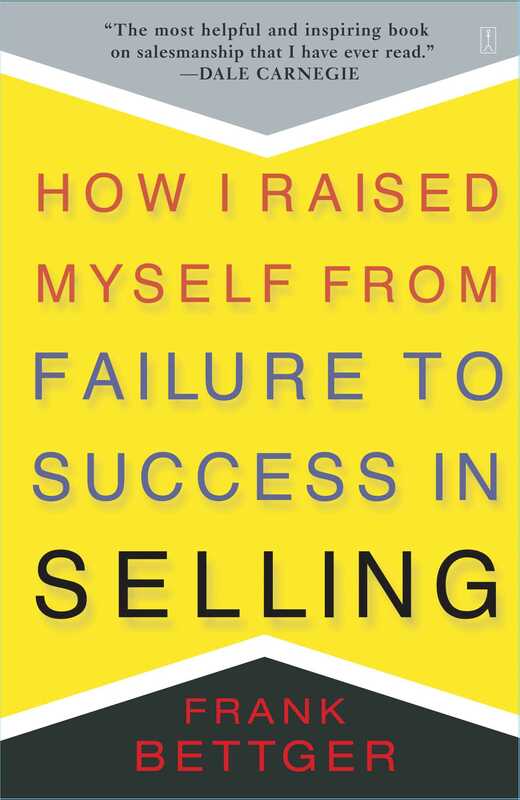 Dale Carnegie How I Raised Myself from Failure to Success in Selling will be helping salesmen, regardless of whether they are selling insurance, or shoes, or ships, or sealing wax, long after Frank Bettger has passed away.